After battling the M25 traffic heading to Wembley for the Football League Cup final my friend and I made it to Cheshunt Football Club, the home of Tottenham Hotspur Ladies as they took on league leaders Manchester United. To our relief, we managed to grab the last parking space with twenty minutes left until kick off! 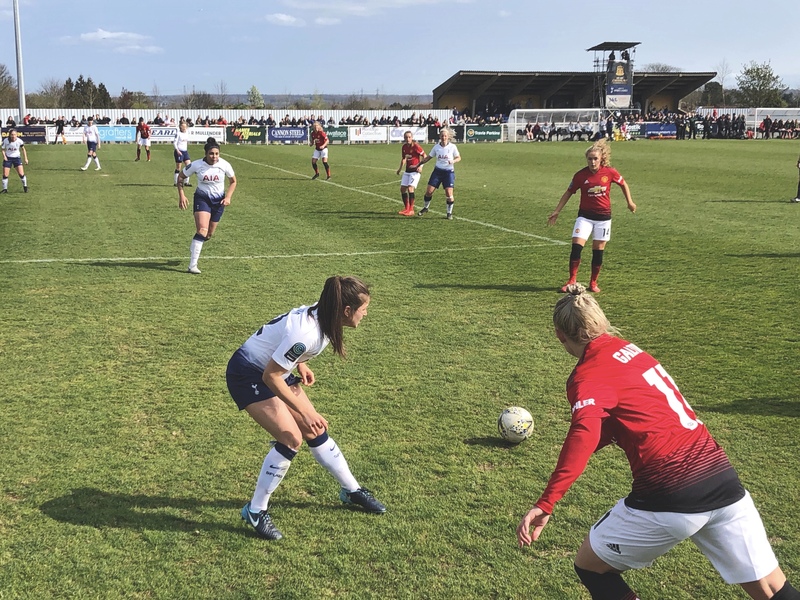 Spurs started brightly with Angela Addison causing havoc in United’s defence but was unable to find Rianna Dean in the box. It was United who opened the scoring though. Midfielder Katie Zelem opened the scoring with a long-range effort. It was a windy day in north London and from my perspective, at the opposite end of the ground, it looked like the wind has a part to play in the goal with it catching Spurs keeper Chloe Morgan off guard. It didn’t take long for United to double their lead. Megan Wynne was adjudged to have fouled Leah Galton and Zelem stepped up to grab her’s and United’s second goal. Spurs were able to pull a goal back through Jenna Schillaci’s free kick. The home side managed to fashion a great chance just before the half time whistle. Emma Beckett’s cross looked to have found Renee Hector at the far post but she was unable to test Siobhan Chamberlain in the United goal. After finishing the half brightly Spurs will have been really disappointed to have conceded so early into the second half. Leah Galton was again causing problems down the United left and it was her cross which was turned in by Mollie Green to put her side 3-1 up within a minute of the restart. This wasn’t in the game plan for the home side. Man United's Greenwood and Devlin combine. Casey Stoney introduced Lauren James, Martha Harris and Lizzie Arnot. 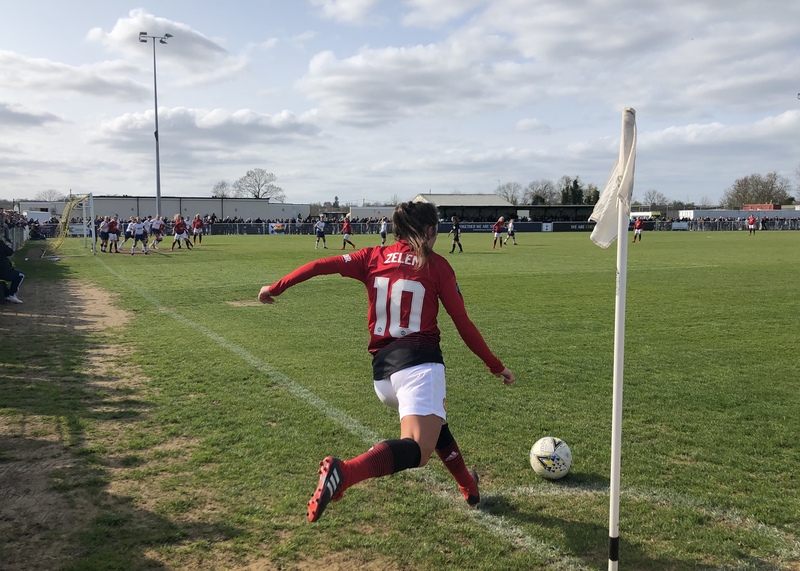 It was Arnot set up Jess Sigsworth to head in United’s fourth to put the game (and league title) beyond doubt. Leah Galton must have been in for a shout for the player of the match award, she absolutely tormented Wynne and her second-half replacement Lucia Leon. It was Galton who completed the scoring with another header from a Zelem free-kick. While United were good value for the win had Hector converted her chance just before half time then the second half could have been much more interesting. Spurs have come a long way in the last few years and with Yeovil Town’s financial troubles there might still be a route into the top flight for Karen Hills’ side. Based on today’s performance they will need reinforcements to bridge the gap and make an impact in the WSL.